Hey, you always have to be careful when down near the ice of a hockey game. 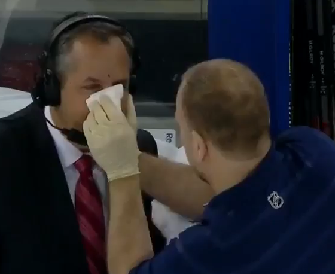 Case in point, John Giannone, rinkside reporter for Rangers telecasts on MSG, took a puck to the face after defenceman Marc Staal tried to clear the puck. The best thing is, he continued to report from his area between the benches, even while getting patched up. Good man. Let's go to the videotape. Two things. First, where is Rob Riggle? Second, can this happen to Pierre McGuire one of these days?